Egypt’s parliament speaker Ali Abdel Aal on Saturday met with several German officials as part of his trip to Germany to hold talks with authorities regarding Egypt’s stability, and in the field of legislation. 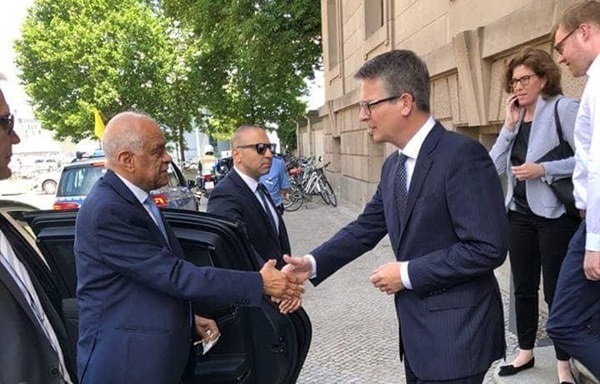 Abdel Aal met with the German Bundestag President Wolfgang Schaeuble, and his deputy Claudia Roth separately, and the head of the Bundestag Tourism Commission Sebastian Münzenmaier. During his meeting with Münzenmaier, Abdel Aal said that Egyptian society is witnessing an unprecedented degree of security and stability. He called on Germany to facilitate the conduct of tourist trips to Egypt and to amend the law that imposes a tax on travel tickets abroad. Abdel Aal reviewed the current composition of the House of Representatives, and also reviewed the most important legislation and laws issued by the Egyptian parliament during the last two years, such as the laws of health insurance, investment, building churches, and illegal immigration. He pointed out that the turmoil witnessed by the region since 2011, especially in the neighboring countries of Egypt, has placed a lot of burdens on the economy and inside Egypt, as many displaced refugees from neighboring countries have arrived. Abdel-Aal said that Egypt faces another challenge in terrorism, and the state is keen to balance its war on terror and the promotion of human rights. Schaeuble said that Egypt is an important and strategic partner to Germany, which necessitates the need to strengthen cooperation between the two countries, pointing out that Germany is already seeking to increase its investments in Egypt.